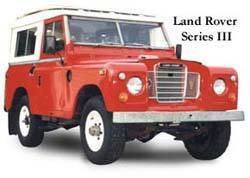 As fans of Land Rovers just like you, we know how hard it can be to find parts that fit older vehicles like the Land Rover Series 3. But over the past 4 decades we have been able to build an inventory of all sorts of Series 3 parts, from popular to hard-to-find, from small hardware items to completely rebuilt engines. So now when you prepare to do a repair job on your Land Rover, or need to stock on up maintenance items for the vehicle, just head to RoverParts.com. The items you want are easy to find and we clearly indicate which model Land Rover each part fits so you will no longer have to guess. If you have questions on any item, or want to know which tools or ancillary parts may be need for a repair job, just call us at 1-800-533-2210 and we'll be glad to help.